Some would say loan processing is easy. Just fill in the blanks on your loan software and your done. Not True. Capstone’s philosophy is one of “HANDS ON”, without using any software. We believe in teaching processors how to calculate all the numbers by hand and why it’s important. Learning your company’s mortgage software is so much easier when you understand how to do the numbers yourself. The Loan Processor scrutinizes every line item on the residential mortgage loan application for accuracy and authenticity before signing off on the file and sending the loan application to the underwriter for approval. Kathy Lewis’s processor training takes complicated topics and breaks them down into simple concepts in a logical order. 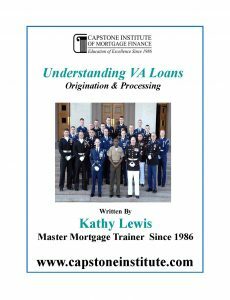 Capstone Institute has been perfecting their “Best Practices” methods for training loan processors and loan originators since 1986. Capstone Institute-trained processors are better organized and understand how to calculate all of the numbers without relying on their mortgage software. Our structured training prepares processors to perform their duties and responsibilities quickly with minimum management supervision. Our training covers every job skill a new processor needs to understand . For Over 31 Years Capstone’s Training Materials And Certificates Are Nationally Recognized. While in training you’re going to process a complete loan file and get it ready for shipping to underwriting. Open the loan processing manual and everything that’s listed is going to be covered. That’s why it takes 16 hours to complete this training. There are no shortcuts with Capstone. As a processor, you must be more knowledgeable than your loan originators and sometimes even your boss. Your expertise must include all current federal regulations, all conventional loan types both traditional and nontraditional, to include adjustable, hybrids and many others. Mortgage regulations, processing rules and financial calculations are intimidating to many but they really aren’t when Kathy Lewis shows you her best practices for loan processing. One of the many advantages with our conventional loan processing training is that it’s been constantly updated and perfected. Our conventional processing training is extremely detailed and your expected training time is about 16 hours. You’ll actually process a complete simulated loan file. After 3 to 5 years of work experience, many processors advance into underwriting and higher management positions. Since 1986 your instructor Kathy Lewis has always offered free lifetime support.